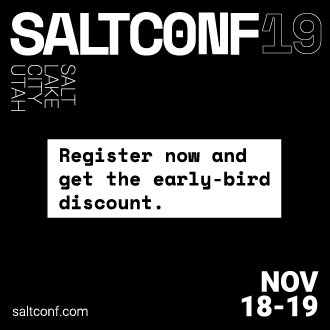 Salt Cloud provides a powerful interface to interact with cloud hosts. This interface is tightly integrated with Salt, and new virtual machines are automatically connected to your Salt master after creation. /etc/salt/cloud: The main configuration file, contains global settings that apply to all cloud hosts. See Salt Cloud Configuration. /etc/salt/cloud.providers.d/*.conf: Contains settings that configure a specific cloud host, such as credentials, region settings, and so on. Since configuration varies significantly between each cloud host, a separate file should be created for each cloud host. 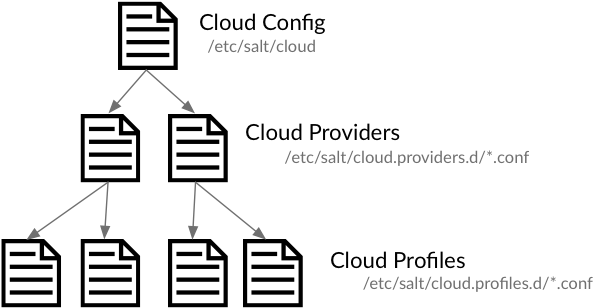 In Salt Cloud, a provider is synonymous with a cloud host (Amazon EC2, Google Compute Engine, Rackspace, and so on). See Provider Specifics. /etc/salt/cloud.profiles.d/*.conf: Contains settings that define a specific VM type. A profile defines the systems specs and image, and any other settings that are specific to this VM type. Each specific VM type is called a profile, and multiple profiles can be defined in a profile file. Each profile references a parent provider that defines the cloud host in which the VM is created (the provider settings are in the provider configuration explained above). Based on your needs, you might define different profiles for web servers, database servers, and so on. See VM Profiles. Configuration settings are inherited in order from the cloud config => providers => profile. For example, if you wanted to use the same image for all virtual machines for a specific provider, the image name could be placed in the provider file. This value is inherited by all profiles that use that provider, but is overridden if a image name is defined in the profile. Most configuration settings can be defined in any file, the main difference being how that setting is inherited. The Salt Cloud Quickstart walks you through defining a provider, a VM profile, and shows you how to create virtual machines using Salt Cloud.